Your SEANET blogger is at home today, engaged in a Candyland marathon with a sick toddler. With only a few moments to steal for this post, it is not simply impossible for me to come up with any original thoughts, it would be inadvisable given the mental state induced by the prolonged company of a feverish 3 year old. In addition, it’s a hot, humid day here in New Hampshire, and the SEANET blogger is especially grateful for a reminder of cooler seasons. Thus, I share with you the thoughts of Seanetter Diana Gaumond, volunteer on Cape Cod. She included this note along with a January survey report. It seems to capture the very essence of the Seanetter’s determination, and, perhaps, eccentricity. The Massachusetts Department of Conservation and Recreation (DCR) is engaged in ongoing research on gulls and their potential impacts on drinking water reservoirs in the state. Three species of gull, Ring-billed, Herring and Great Black-backed, are continually being captured, banded and released in an effort to learn more about the travels and activities of the birds when they are not visiting the Quabbin and Wachusett reservoirs. In addition to the standard issue leg bands used in most bird studies, DCR birds are also tagged with conspicuous, brightly colored wing tags. This enables even casual observers without binoculars to report sightings. 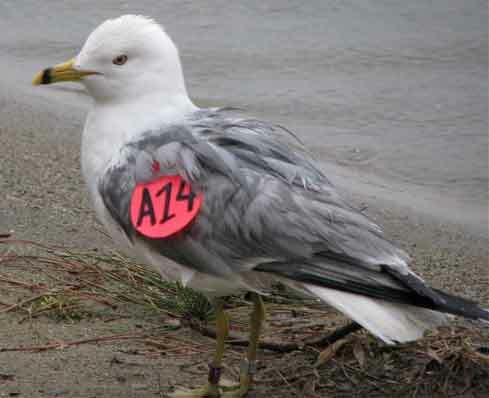 This past week, the SEANET blogger spotted a Ring-billed Gull with a fluorescent pink wing tag in Ogunquit, Maine. The bird was begging chips and sandwiches off of beach-goers. Upon contacting Dan Clark at DCR, the blogger learned that this bird was captured in Shrewsbury in central MA back in October. She’s an adult female, and had not been seen since her tagging. The blogger was thus quite gratified to help out by reporting this bird. 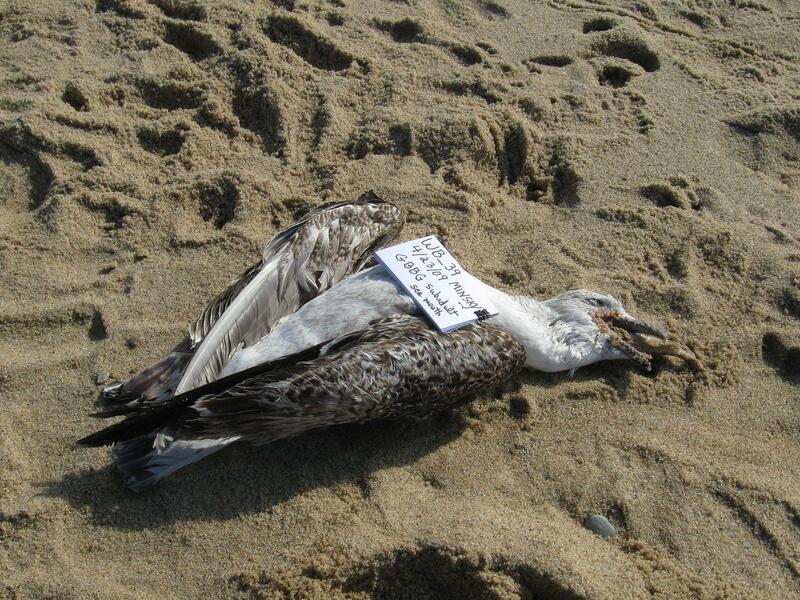 Though thousands of people were on the beach with the tagged bird, no one had apparently bothered to find out where to report the tag. So never assume a bird you see has already been reported; all sightings are valuable! SEANET Local Coordinator, Jamie Bogart of the Lloyd Center in Buzzard’s Bay, Massachusetts, has also seen a number of these tagged gulls and inquired with SEANET about where to report sightings. If you should encounter one of these gulls (and really anyone could given the great distances the birds often travel), please contact Dan Clark (Dan.Clark@state.ma.us) or Ken Mackenzie (Ken.Mackenzie@state.ma.us). And be sure to check out their study website where you can learn all about their work and even follow the movements of some of their satellite tagged birds. Royal Tern found by Rebecca Bell in Georgia in February. We see some strange things here at SEANET. One might think that wild birds would not do anything so dumb as to try to eat a much-too-big prey item and then die by choking on it, but it appears that it does happen with surprising frequency. Recently, our own Dr. Julie Ellis found a kingfisher thrashing around in the road. She stopped to examine the bird, which appeared about to expire, and discovered a large fish protruding from its bill. She extracted the fish, and released the bird which flew off erratically. Its ultimate fate remains unknown. Two Seanetters have found birds dead with incriminating half-swallowed fish at the crime scene. 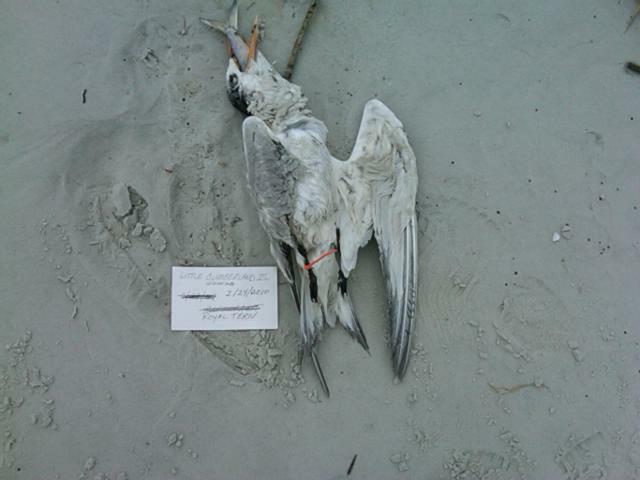 Rebecca Bell of Georgia found a Royal Tern, while Dennis Minsky found a juvenile Great Black-Backed Gull. 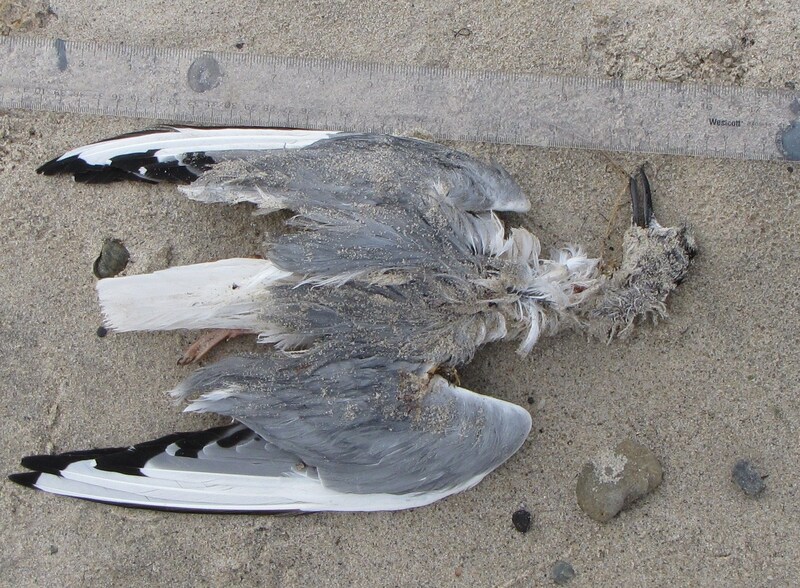 While it’s not possible to determine from the pictures whether death was caused by strangulation subsequent to an episode of eyes-bigger-than-head disease, it is not unprecendented in seabirds. 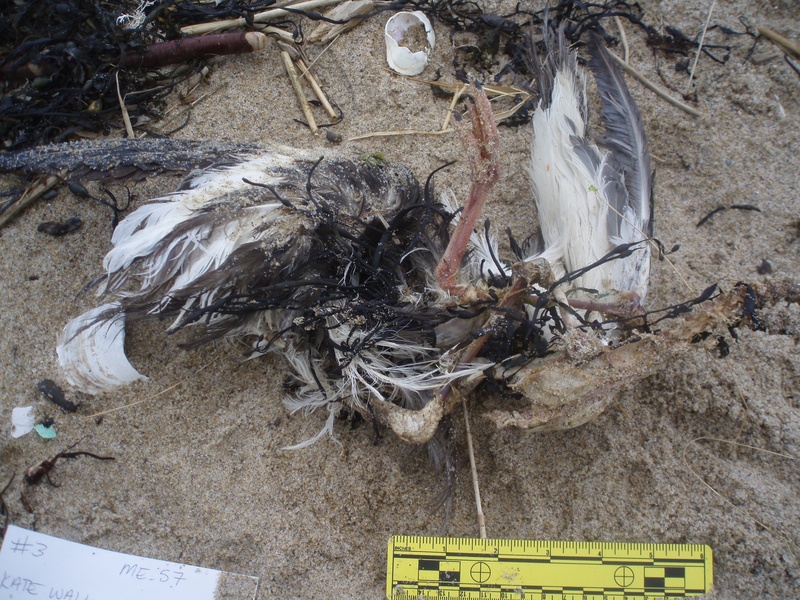 Northern Gannets have been found dead with large striped bass lodged in the esophagus. Post-mortem examination has shown that the birds died when the blood vessels to the head were constricted by the pressure of the fish against their walls. Great Black-Backed Gull with fish in mouth found by Dennis Minksy. Revenge of the prey fish? "Clammy" the Common Eider: he apparently bit off more than he could chew. Another means of death by food is demonstrated by the unfortunate Common Eider shown here. Affectionately known as “Clammy” in the SEANET office, the bird likely died of dehydration based on the position of the shell obstructing the entire oral cavity. Certainly, nature is brutal in its dealings with the less fit individuals of a species. And there is a possibility that these birds were killed by some other cause while in the act of swallowing a fish, but it seems plausible that the fish itself dealt the fatal blow. At the least, these instances stike the SEANET blogger as grimly absurd, and sometimes seem reminiscent of the close of a Shakespearean tragedy, where heroes and villians, killers and victims all lie dead in a great heap. Forgive the hyperbole, Seanetters, for it is late in the day and your blogger is dangerously decaffeinated. Thanks to our intern, Sarabeth Buckley, we are in the midst of a volunteer recruiting blitz in Massachusetts (click here for a list of upcoming training sessions). Sarabeth and the rest of the extensive SEANET staff (Julie Ellis and Sarah Courchesne) were all interviewed by the Daily News in Newburyport, MA about our program. Check out the article, which was on the front page of yesterday’s paper, as pointed out by Daily News reader, Sarah Courchesne’s Dad. Thanks to Daily News correspondent Susan Deily-Swearingen for taking the time to talk with us and for taking an interest in our program. Now we sit back and await the onslaught of volunteers certain to result from this publicity! What?! Only ONE guess on this week’s quiz? What are you all, on vacation?! Bonaparte's Gull in flight. Note the prominent white stripe on the primary feathers. Only the intrepid John Stanton offered a guess, and he’s 1 for 2. 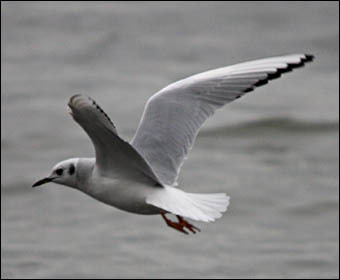 John correctly identified Bird A as a Bonaparte’s Gull. These Arctic breeders overwinter up and down the East Coast, and are found on lakes, rivers and ocean waters. They usually do not mix with other gulls, and will form large flocks where prey is abundant. They are smaller than most other gull species found by Seanetters. Distinguishing features of this gull apart from its small size are its thin, black bill and the conspicuous white triangle on the outer primaries. “This is not a Sabine’s Gull, since the feet are totally wrong in both color and shape (no webbing). In fact, this is an American Oystercatcher, which explains the wing pattern and the thick pink legs with prominent, rounded nails. Alternate view of Bird B, an American Oystercatcher. Note the lack of foot webbing and the white stripe on the upperwing. 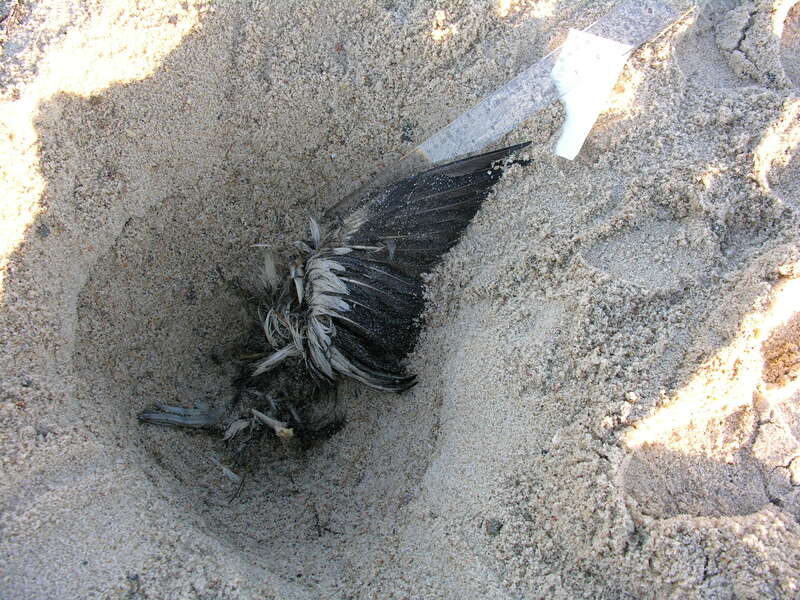 This bird was, in fact, found on Scarborough Beach in Maine, falling within the limits of the only population of that species in the state. 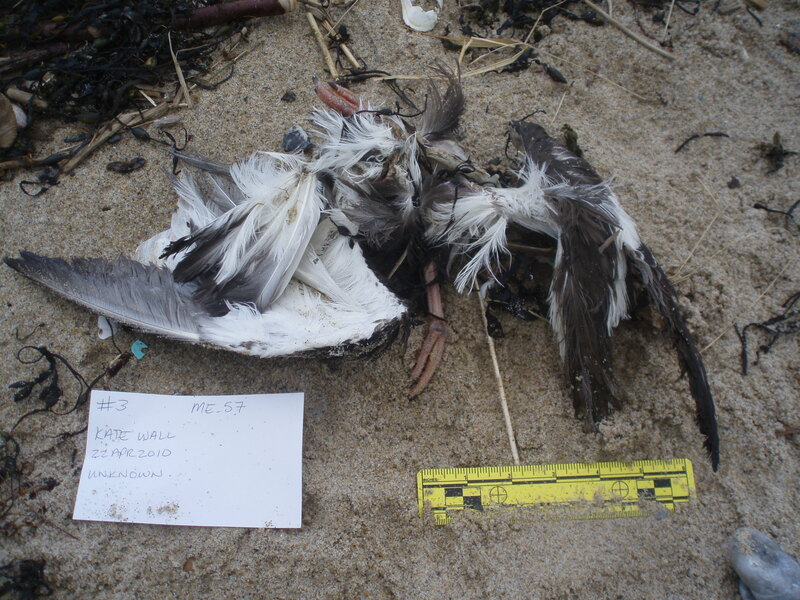 Seanetters are a savvy bunch when it comes to dead birds. Difficult to stump, and quick to respond, your SEANET blogger felt they deserved a special challenge for this dead bird quiz. Bird B, found by new Seanetter, Kate Wall, in Maine is a particularly tough one. Bird A, found by long-time Seanetter Rey Larsen is a relatively unusual find on a SEANET beach, though the id is made considerably easier given the presence of a head. Bring on the guesses/confident assertions as usual. Post them as comments and the answer will be posted later this week. Good luck Seanetters! Bird A: Found in Rhode Island in April, 2010. Bird B: Found in Scarborough, Maine in April 2010. 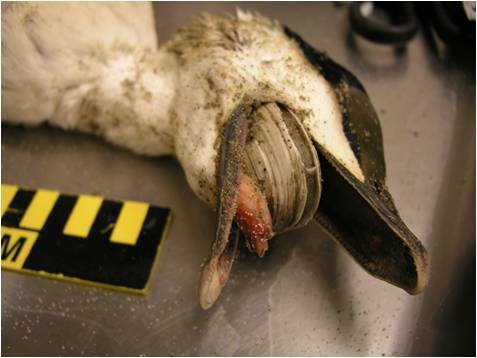 In yesterday’s post, your SEANET blogger reported that gannets were the species most severely affected by the Gulf oil spill. That was based on a report from the Mobile sector and referred only to the birds recovered in Mississippi, Alabama and Florida. Throughout the Gulf as a whole, Brown Pelicans have been hardest hit, representing over 50% of the total oiled birds recovered live. 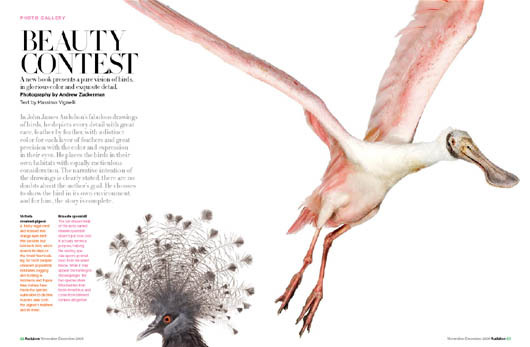 The spectacular photos of Andrew Zuckerman have been featured in Audubon magazine. With that bit of business attended to, the SEANET blogger wants to share an amazing series of photos by photographer Andrew Zuckerman. The works are high definition images of birds against a stark white background. Britain’s Telegraph newspaper recently featured a slideshow of some of the photos, so take a look, but be forewarned, it may cause you run out and buy Zuckerman’s new book, Bird.